Menu is very intuitive and easy to navigate. There is a surprising large amount information for various cuts of meat and vegetables/fruits, even lesser used cuts such as sweetbreads and pork spleen; and usually 2-3 different combinations of temperature and time for each cut. You have the ability to add a certain cut to your ‘favourites’ menu, making it easier to select, say…. “pork belly’ almost instantly, if for some strange reason you want to cook pork belly everyday for a week. It costs S$1.99, which is pretty cheap for a wealth of sous vide information. Lots of good background information like food safety, intro(how sous vide is beneficial), a ‘how to use this app’ section(pretty similar to the intro), and sous vide resources (mainly the more infamous sous vide links). Although to be fair, all of this can be read on 1-2 webpages online. As I mentioned earlier, some cuts of meat have very informative writeups, while the majority of others use a pretty standard template, meaning they don’t really describe how the different temperatures and cooking times affect the outcome of the meat, which I personally think is the most valuable information. I was pleasantly surprised with this application to be honest, I had expected minimal information on the more common cuts of meat, but there is quite an extensive list provided with the application. Everyone seems to have a different idea on which temperature and time combination to use for any particular cut of meat, and each yields vastly different results. 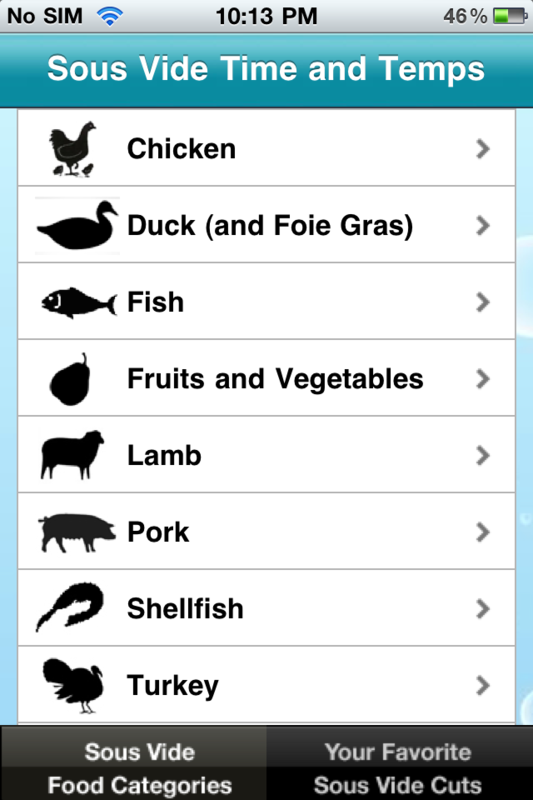 This application takes out the searching element for you, it tells you the possible combinations; but where it falls short is telling you how each combination affects the outcome of the meat. You often get combination headings like “Rare”, “Ideal”, and “Traditional”, which seem pretty cryptic because everyones intrinsic value to what “ideal” and “traditional” should be can be completely different. Very often when I’m cooking sous vide and Im tasting the final product, I know its good, but I’m not entirely sure if I’m doing it right- Yes this is a delicious duck confit, but is this what the duck is supposed to taste like after being cooked at 75C for 9 hours? The application lacks the information to clear this up. Also, while most of the temperature/time combos I agree with, some seem to jump out in a bad way. “Rare” chicken breast is cooked at 57.8C for 1-4 hours, that strikes me as being incredibly low and unsafe. Every blog that I’ve been to on sous vide has never gone below the 60.0C mark for chicken, it really makes me wonder where the app is getting their combinations from. That being said, $1.99 is a very small price to pay for all the temp/time combinations provided, if you’re too lazy to run a google search for that cut of meat you are about to cook, and cross check cooking temperatures and times between 4-5 blogs, then this app is definitely for you. Haha I always watch those chefs in top chef and other cooking shows using sous vide. Thanks that my blog could make u happy lol. I really enjoy reading ur fine dining experience! 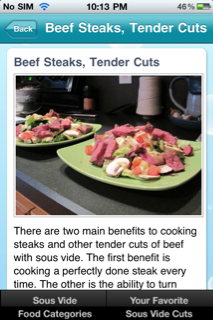 Thanks for the great write up of our Sous Vide App, I think you nailed the pros and cons very well! For the chicken, it’s actually a pretty common misconception that it has to be cooked above 60C. It’s safe above 57.8C as long as you cooking it for long enough. Here’s a link from our site that discusses the safety of it a little bit more with information pulled from the USDA, Douglas Baldwin, and the Series Eats series. That said, it still tastes like raw chicken to me! Hey Jason, kinda flattered that you managed to find my writeup, thanks for the link too, very informative writeup about the safety aspect of Sous Vide; but I think I’m pragmatic in the sense that, just because you can cook chicken at 57.8C, doesnt mean that you should. Which was my point about having better writeups describing the texture of the meat so that people know what to expect when they drop their chicken into a water bath at 57.8C, but to do that for every single cut listed in your app would be an immense task. Yeah, I definitely see where you’re coming from. It was a hard line to balance on between giving enough info to be useful and giving great info on each cut. Hopefully we can keep expanding it and making it better! I’m glad you’re enjoying it and thanks a lot for the feedback, it’s always great to hear from people enjoying our products. We have come up with something like that a while a go – intended for professional use and it rocks! 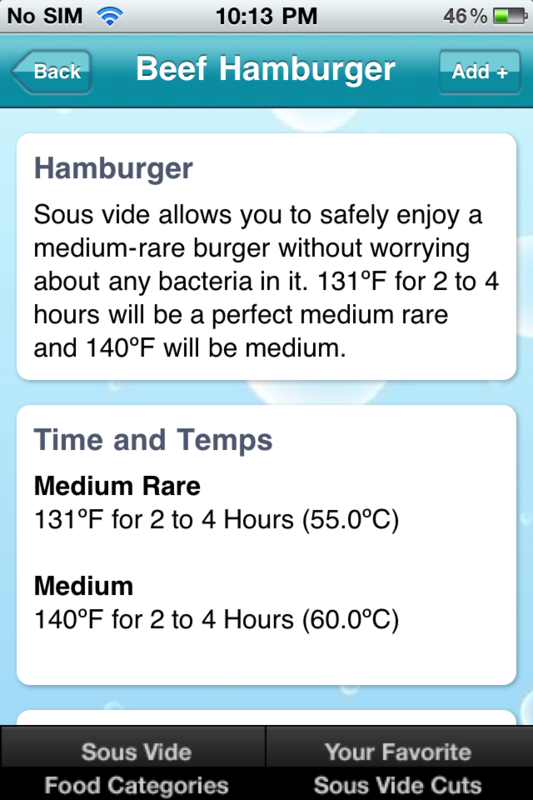 I just found your app “Sous Vide Celsius”, Ill probably make a purchase and try to write up a review soon!